Have you been in a car accident in St. Louis and are wondering whether chiropractic can help? Calling a chiropractor is always a good move after being involved in a car accident. Chiropractors can diagnose and treat many common auto injuries, including whiplash, neck pain, back injuries, and soft tissue injuries. Even if the auto accident occurred at a low speed and you did not feel any pain initially, you should still be evaluated by a St. Louis chiropractor. You may be injured and not know it. Often, signs of injury develop days after the accident, and if you delay seeking treatment, it may take longer to restore your health. Chiropractic care is more effective when delivered as soon as possible following the initial injury. Chiropractors are skilled at spotting signs of car accident injuries such as whiplash, which can occur even at speeds as low as 5 miles per hour. Chiropractors specialize in musculoskeletal conditions, particularly those affecting the spine. 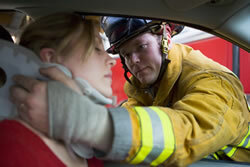 Car accidents, even minor ones, commonly cause spinal injuries. These seemingly minor spinal injuries are not often detected by the routine medical care patients may receive following a car accident, yet they can lead to chronic pain. These chronic injuries may affect your quality of life long after the car accident. For this reason, it is important to have your spine examined by a chiropractor as soon as possible following the accident. Car accidents also have a tendency to cause soft tissue injuries affecting the muscles and ligaments. These are not seen externally, yet can lead to serious medical concerns such as spinal disc degeneration. Soft tissue injuries cause scar tissue, making your muscles less flexible and leaving them prone to future re-injury. If you experience muscle pain or weakness, soreness, or any other symptoms indicating muscle injury following a car accident, seek chiropractic care. St. Louis chiropractor Dr. Holland treats many patients suffering from auto injuries. If you have been involved in any type of car accident in the St. Louis area, contact Accident & Pain Relief of St. Louis as soon as possible for treatment.